This week on “In the Style of…” we’re looking at Slash from bands such as: Guns’n’Roses and Velvet Revolver. Recently, Slash has been involved in his own solo project too. 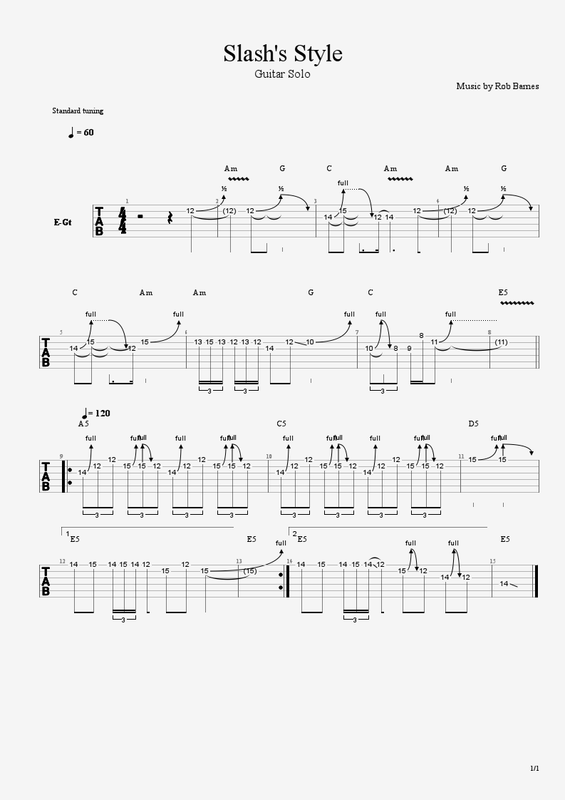 Scroll down if you would like to see the example piece using Slash’s style (with tab). Slash was born on the 23rd July 1965 and (surprisingly) his real name isn’t Slash, it’s ‘Saul Hudson’. He was named after the artist ‘Saul Steinberg’, and was given the name by actor Seymour Cassel (better known for playing Max Fischer’s dad in the 1998 film ‘Rushmore’). He was given the name after showing a lot of energy and zipping around the place at one of his house parties. …and David Bowie, whom she later dated. Slash moved from Stoke-on-Trent, England, to LA when he was 5, and is best known for his work with Guns’n’Roses and later with Velvet Revolver. He is currently working on his own solo work with vocalist ‘Myles Kennedy’. Appetite for destruction- released by Guns’n’Roses just before Slash’s 22nd birthday- was the best selling début album of all time in the US, but Slash wasn’t made a US citizen until 1996 (about the same time he was leaving the band). He is also a Board Trustee for the Greater Los Angeles Zoo Association, and an honorary and active member of the ‘Little Kids Rock’ music education program. Slash’s influences include: The Rolling Stones, Cream and Led Zeppelin, In fact, Jimmy Page is a huge and noticeable influence in his technique and sound (probably including his choice of Les Paul). Slash started out playing on a one-stringed flamenco guitar, after deciding on starting a band with his friend and later G’n’R bandmember Steven Adler. His first band ‘Road Crew’ was named after the Motörhead song, and they worked on several riffs that would eventually find their way into Guns’n’Roses songs. Slash is credited- along with Zakk Wylde- with bringing the Les Paul back in to popularity in the latter half of the 1980’s. His main studio guitar is a 1959 Les Paul standard replica, and he uses a 1988 Les Paul standard for live performances. 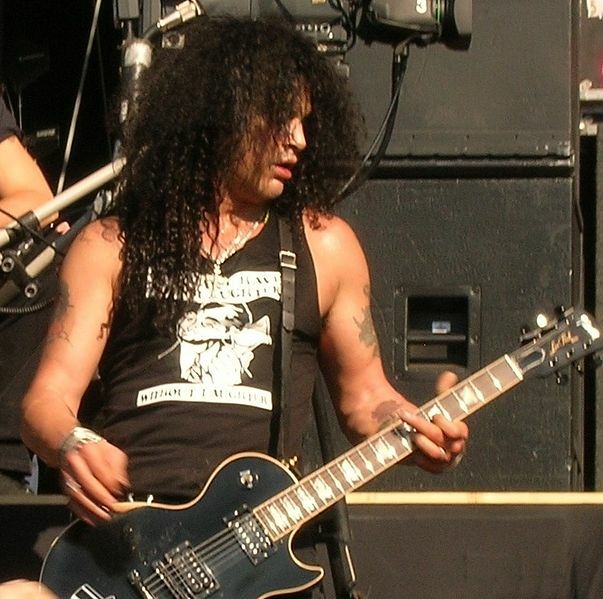 In fact, Slash has 13 different signature Les Pauls – four of which are made by Epiphone. All of his guitars use Seymour Duncan Alnico II Pro Slash APH-2 pickups and they are occasionally tuned down half a step, or tuned to drop-D. He also uses Ernie Ball 11-48 strings and Dunlop Tortex picks, which are- and I quote Slash himself- ‘the heaviest ones they make’. Slash uses Marshall Amps almost exclusively, and lays claim to having the very first signature amp that Marshall Amplifiers ever made! He has also used a Vox AC30 and some smaller Fender amps with the band Velvet Revolver. His preferred amp on stage is the JCM 2555, which is the signature amp made by Marshall. He also used the Marshall AFD100, which is a recreation of the Marshall 1959, on the Guns’n’Roses album ‘Appetite for Destruction’. With those he uses Celestion Vintage 30 stocked Custom 1960 cabs. For his clean tone: bass on 3, mids at about 5, and treble all the way up to 10. For his dirty tone, you’ll want the gain around 7- for that classic rock sound- bass on 7, mids on around 4, and treble at 7. Slash uses all his amps turned up to 10. He is also fond of rolling down the tone control on the guitar, to take out some of the harsh pick attack from the sound. Slash isn’t a huge fan of many different effects, for example, he has an MXR stereo chorus pedal for ‘that bit in Paradise City’…and for nothing else. He never used it again. – which was designed after a pedal that Slash custom built himself. He generally sets it up so that the guitar goes into the wah pedal, then the phase 90, then the boost, then the chorus (or any other effects he wants). This is then sent to an A/B switcher pedal which sends the dirty signal to the left top and bottom cabs, and his clean signal to the right top and bottom cabs. All of this is connected up with ‘Monster Rock’ cables. 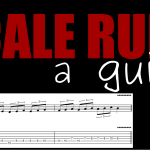 I wanted to show Slash’s approach to melodic soloing, as well as some faster stuff. Slash generally plays (or at least, writes solos) by ear and it’s possibly because of this that he uses a lot of chord tones in his solos (i.e. notes taken directly from the chords). This might also be why he uses a lot of string bends when he plays (so he’s literally bending the notes- by ear- to the pitch he wants). This is true of our example, where the first note is a “B” on the 12th fret of the B string, which you then bend up to a chord tone (a “C”, the minor third) over the A minor chord. This kind of technique can be very useful when improvising because you can just bend almost any starting note until it’s at the pitch you want (plus, it sounds kinda cool!). The note is then bent back to a “B” (the major third) over the G chord. 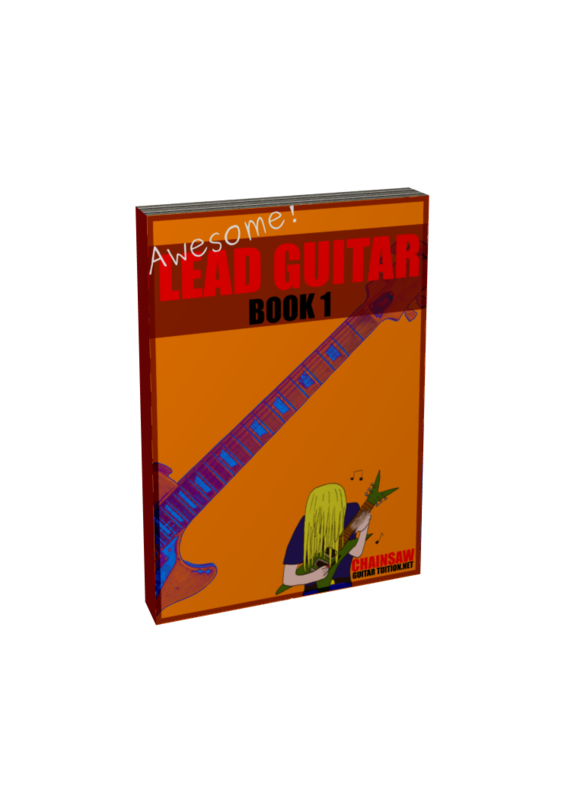 You may also be interested in the backing track and the full solo track. Over the next chord is a blues-influenced lick in which you bend the 14th fret of the G string (an A note) up two frets (so that it sounds as a B), then you play the 15th fret on the B string and hold both notes. Then, you let go of the 15th fret and bend the G string back down. Slash’s playing seems to be very influenced by the blues and blues guitar playing techniques, and this lick is an example of something that he might use to create tension (neither note is a chord tone over the C! ), which is then released by returning to an A (14th fret on the G string) as the A chord approaches. 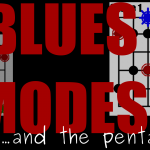 The solo then continues by using the A minor pentatonic scale at the 12th fret (12th position)- Slash typically uses pentatonic scales and their shapes as a starting point and then embellishes the basic shapes with modal inflections (basically, he’s adding notes to the pentatonic to create different scales). 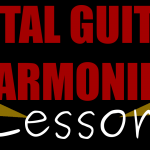 Two of his favourite scales to create from the pentatonic shape are the Aeolian (or natural minor), and Dorian modes. 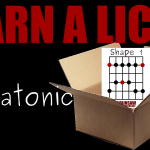 There is a good example of this in bar 6, where there is a descending line containing the 2nd (which is not in the pentatonic), followed by a stereotypical blues lick in bar 7 using a C minor pentatonic shape (with an added major third to fit the C chord). 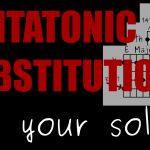 Slash sometimes uses different pentatonic shapes than you might expect over chords to imply more complex scales using familiar shapes- something called “pentatonic substitution”. Following all this melodic playing, things step up a gear. Even when Slash is playing quickly (shredding? ), he sticks to his melodic guns. Here I’ve used the same, repeating lick over the chord changes (bars 9 and 10), which is a technique that he uses to great effect in many of his solos (Slither and the fast solo in Sweet Child of Mine are just two examples). Of course, I end this lick with a bend on the high E string! The repeat endings are based on the A minor pentatonic scale at the 12th fret (again), but here I’ve added the 14th fret E string (an F#, the major 6th) which implies the A Dorian mode. There is also a healthy dose of legato playing throughout- check out the triplets in the last line (bars 12 and 14, beat 2), and the similar figures in bar 6 (beats 1 and 2) which should be played with hammer-ons and pull-offs.